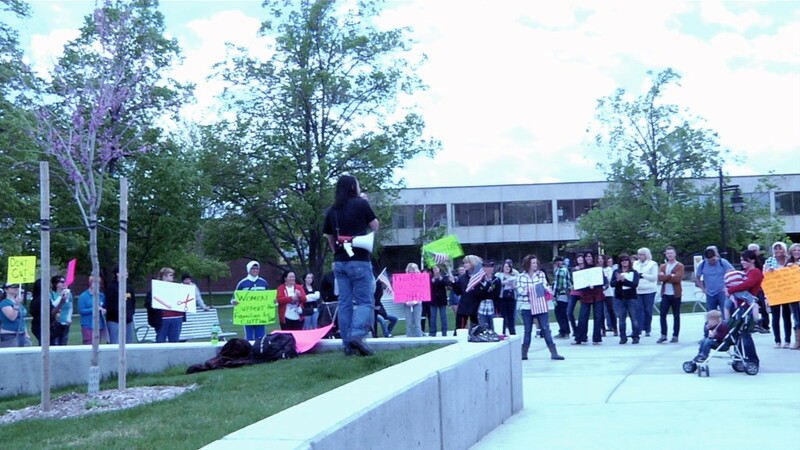 On April 27, 2012 members of the community and students of Salt Lake Community College rallied to protest the college’s decision to cut its Cosmetology program. There were about forty students and community business leaders in attendance at the rally held at the Taylorsville Redwood Campus quad. This administration’s decision to cut the Cosmetology program has shocked many, leaving not only students but also community business leaders reeling. Those going into cosmetology learn a variety of skills, from hair styling to esthetician and nail technician work, and can earn an average of $10.82 per hour, according to the Bureau of Labor Statistics. Currently SLCC has about 200 students going into the field and 5 members of faculty teaching the degree. Salt Lake Community College Cosmetology students have a well-rounded education, according to Ajer, which impacts their employment opportunities. “[SLCC alumni] have the highest advantage at gaining employment. They earn a higher living wage than the average person,” Ajer says. The decision to cut the program initially came at the beginning of April, with the final end date for the program tentatively set for 2014. Costs to continue the program and refit a new building are reasons given by administration for cosmetology closure, leaving students with only a short time to finish their program. “The reason we chose to come here is because we can go to work and school at the same time. Now that we have to push it, it’s extremely difficult trying to work and graduate in two years,” says Haylie Farand, who started in the Spring 2012 semester. With the price of going to a private school ranging from $6,000 to $20,000, costs are also a major concern. Gregory Lucero, President of the Revolutionary Student’s Union, organized the protest, concentrating on what the loss of one trade from the college’s curriculum would have on other trades. “The reason why we’re organizing this protest is that we are against budget cuts and tuition hikes in general on campus…we’re for the working class people in general, which means defending trades. Cosmetology is clearly a trade,” says Lucero.